This shampoo is designed to neutralize skunk odours on your dog or cat. Our natural, sulfate- and paraben-free formula cleans fur gently and is safe to use on puppies and pets with sensitive skin. Wet fur and gently massage in shampoo down to skin, avoiding eye area. Rinse well, dry with towel or cloth, and brush fur. Repeat as needed, using Kuddly Doo vaporizer between washes. This vaporizer eliminates unpleasant odours on contact, leaving a fresh, clean scent that’s never overbearing. 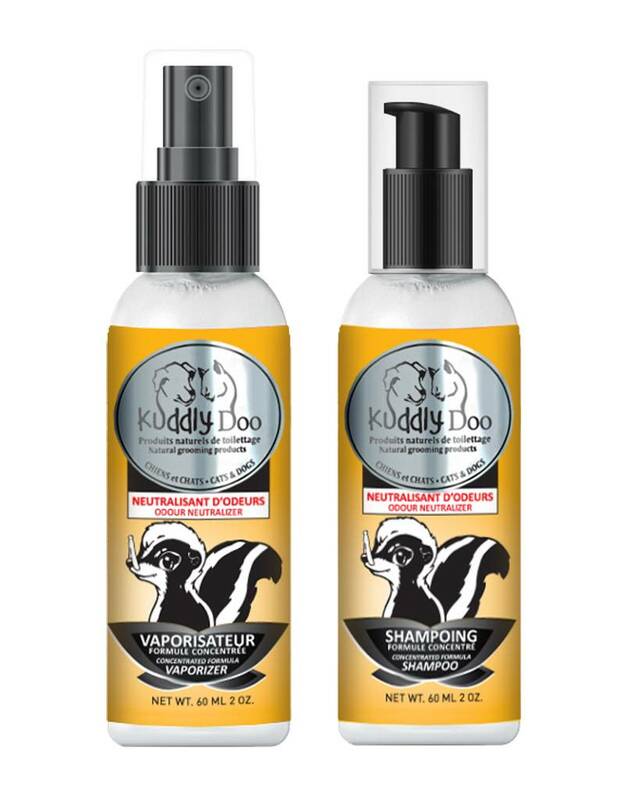 Use in combination with our odour-neutralizing Kuddly Doo shampoo. Spray generously 30cm from your pet, avoiding eyes and ears. Dry with towel or cloth and brush fur.